"Good for the Soul Challenge"
*Use any technique/material you want but it must be 75% CCB products. 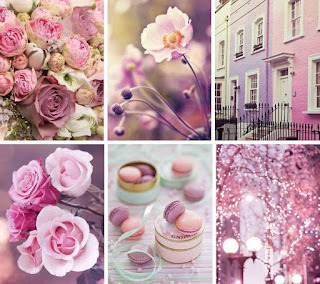 Here is the art inspiration of a monocramatic pink color tones! I started with a plain letter envelope 5x7 size tore it apart and used it as my pattern template. I traced the envelope pattern onto a Canvas Corp Pink & Ivory Dot Reverse paper, cut it out and adhered back together in envelope form. 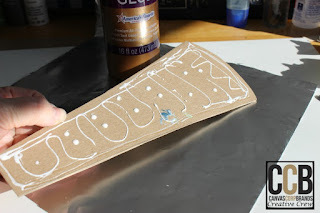 Next I used TCW Light n Fluffy modeling Paste and stencils to create the raised patterns on top of the envelope, allow to dry. Stamped randomly over the front of the envelope in black ink, heat set the ink with a heating tool. 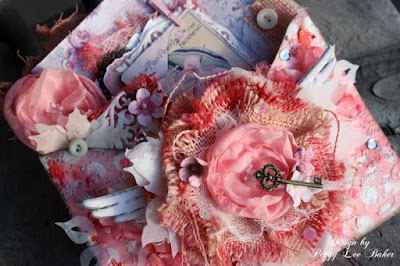 Gathered a few of my favorite Tattered Angels Glimmer Mist in pink tones. Using a round paint brush I dipped in the glimmer mist and patted in a few places over the envelope. 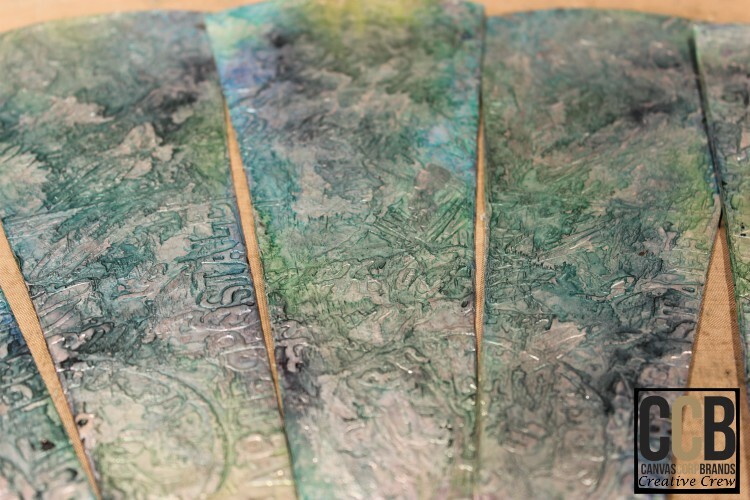 Sprayed with a little water and let the glimmer mist run over and around the raised modeling paste patterns. You can add more or take away with a paper towel or wet wipe. Dry with heat tool. 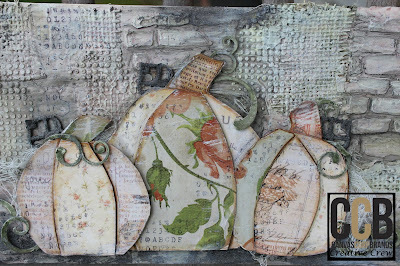 While I had the Tattered Angels glimmer mist colors out I painted a few other items like the burlap flower, ivy tissuestock pieces, cheese cloth....as well as the 2 x 2 stretched natural canvas. 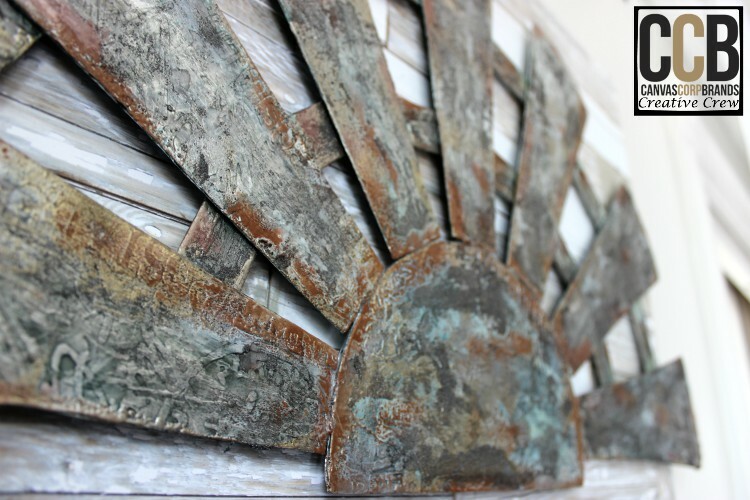 Dry with a heat tool and set aside to dry completely. Lastly I love to embellish I gathered up a few pink color tones products to use and started to build my altered letter envelope. 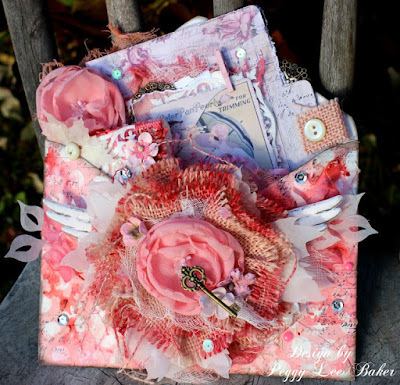 Inside the envelope I created a shabby chic card using the 7Gypsies Gypsy Moments 4 x 6 Printed File Folders as my card base. Added the adorable 2 x 2 Stretched Natural Canvas tucked in. 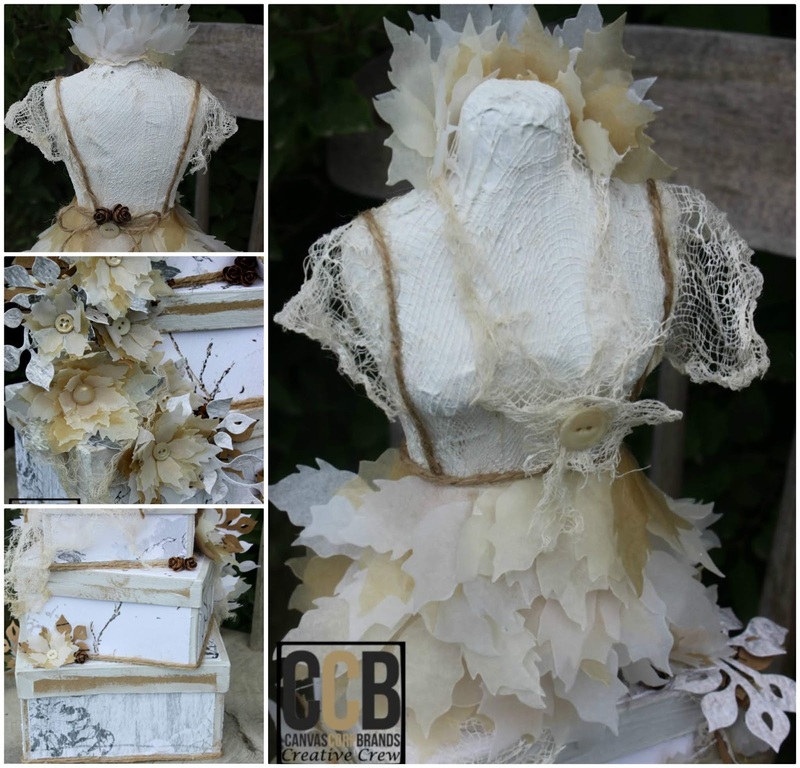 The show stopper is the fabulous Canvas Corp Burlap Flower painted and adorned with my handmade fabric flower, Canvas Corp Tissuestock die cut floral petals and 7Gypsies Architextures Angel Wings tucked in and around the burlap flower. Finishing touches are sequins, buttons, enamel dots. 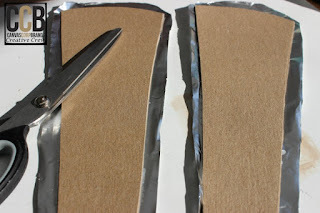 To help give depth to the envelope I used Ranger's Distress Ink in Black Soot sponged around the edges of the envelope. Now it's ready to give as a gift to someone special. 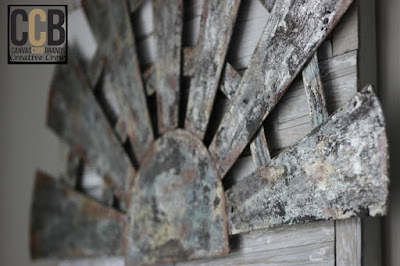 Thanks for stopping by, besure to stop over at the CCB Blog, Here. 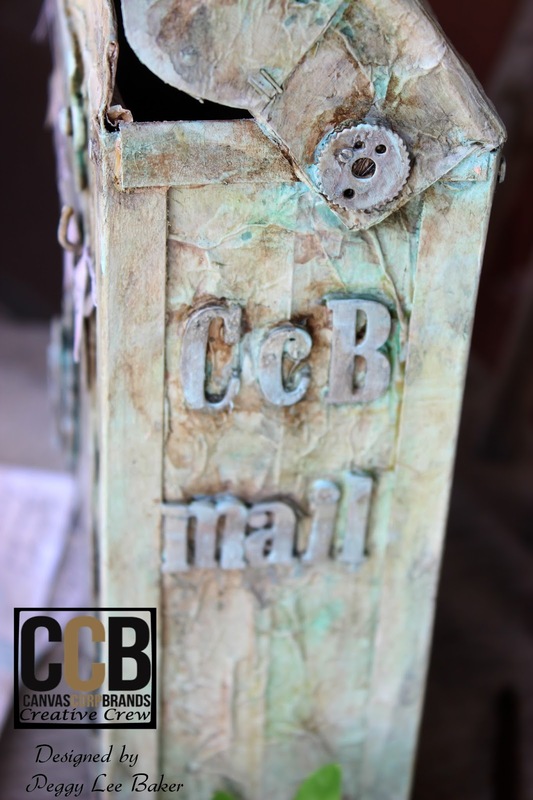 To be inspired by the other CCB Crew Members projects for the challenge. We would love to see yours, please share! Hello Friends, it's Peggy Lee! Thank you so much for stopping by today. You are in for a treat! Today I am participating in a MEGA BLOG HOP!!!!!! There are over 30 fantastic designers world wide that have come together to showcase terrific fall projects that you can recreate and put your own artistic touches on in your craft room. 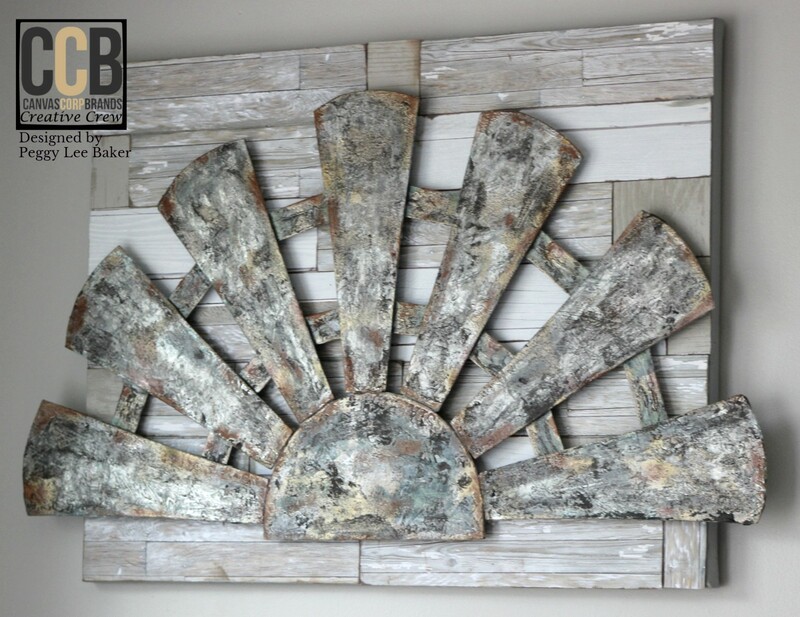 You have seen a lot of these designers featured on sites like Tattered Angels, 7 Gypsies and Canvas Corp Brands! Do you see a trend? 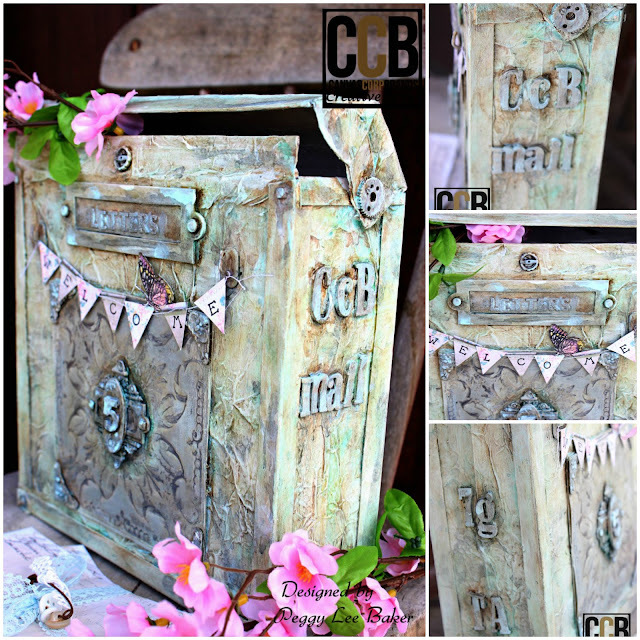 This is the CCB Fall Blog HOP! Each of these designers have created a project to share with you on their blog. Some are offering prizes, so please hop on through to each blog. If you are inspired would you be so kind as to share the hop with others? We would truly appreciate it! If you came here from Natassa Blazaki you are hopping along....welcome! 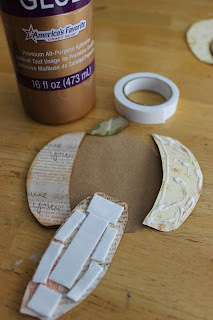 Let's get started with my Fall project.... An Altered Paper Pumpkin Canvas! 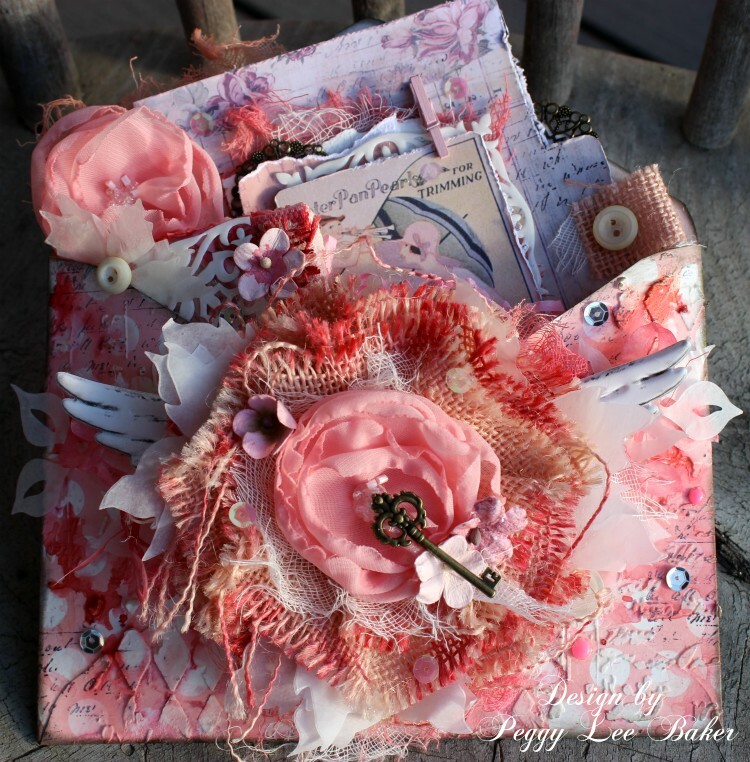 7Gypsies Architextures papers "Travel Habit and Made Fresh"
and florals with hints of old text. base template and then the pumpkin template pieces. in Distress Ink to distress the edges of the paper pieces. give pumpkin life and movement. 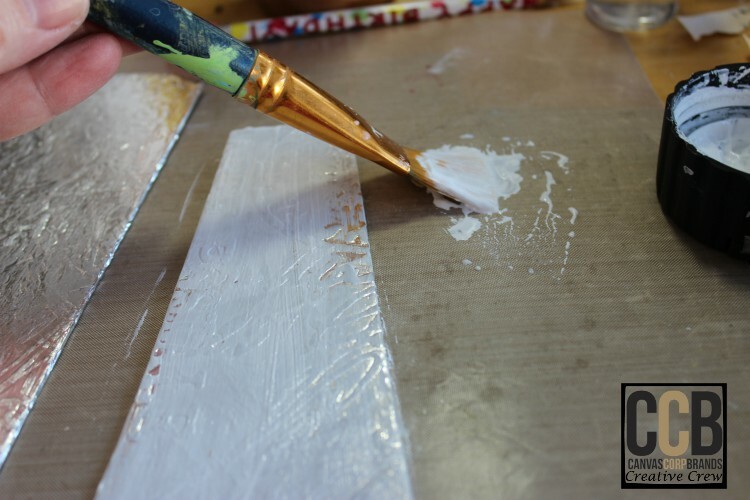 White Gesso painted on a few layers to prime the canvas. I do love how this Gesso goes on so smoothly! I went into my scrap drawer I gathered up a few paper scraps of 7Gypsies, as well as Tissue Stock Kraft and burlap by Canvas Corp.
beautiful backgrounds for your canvas art is a fabulous way to add texture. placing them in a few areas over the canvas. Allow to dry. After the canvas dried completely I started to give the canvas layers in color using Tattered Angels glimmer mist is a ray of colors. Please forgive me I was so into painting the canvas I forgot to snap a photo to share with you....oops! 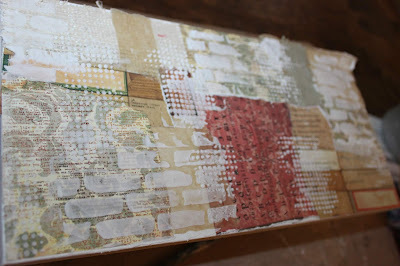 Once the canvas was dry I lightly brushed over the stencil patterns with Gesso to add highlights. Then I used a charcoal pencil to give shadow and depth to the canvas and around the pumpkins after I adhered the pumpkins to the canvas. 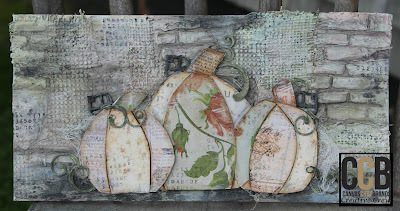 Here is a close up paper pumpkins on the canvas. I hope you have enjoyed my Fall altered paper pumpkin canvas. Thanks again for stopping by the blog and don't forget to hop along to the other bloggers we all have amazing Fall Inspiration to share with you. 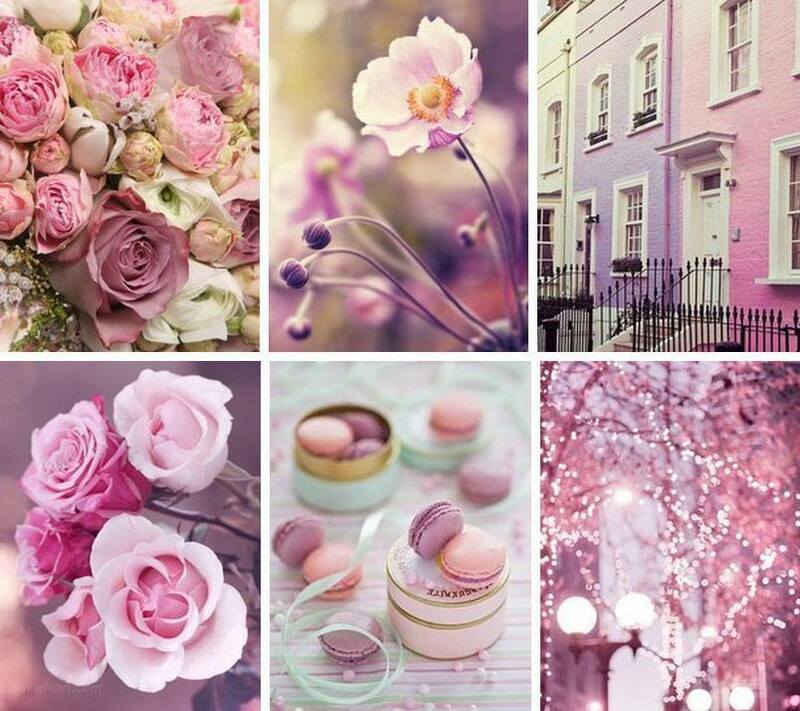 We hope you are so inspired that you join along with us, please share with us. Be sure to leave a comment here on my blog post for your chance to win a SURPRISE giveaway gift from me! You won't want to miss out!!! 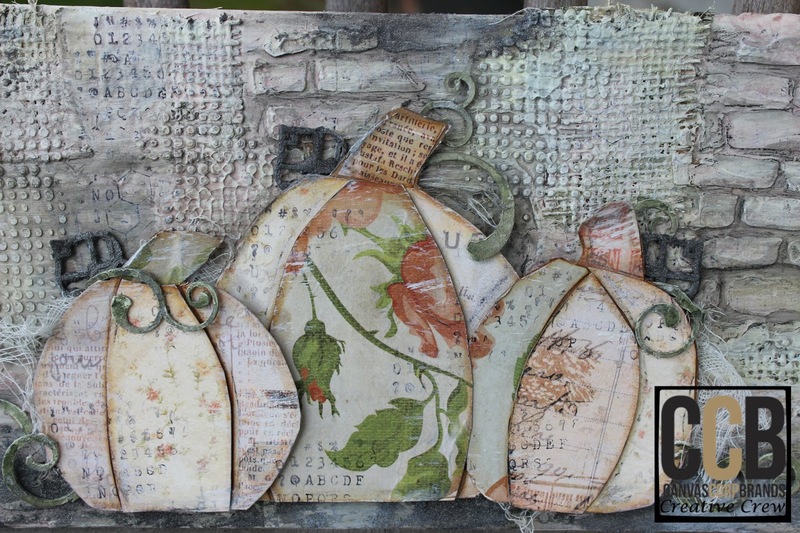 Hop along to Nadine Carlier blog to see her Fall project! 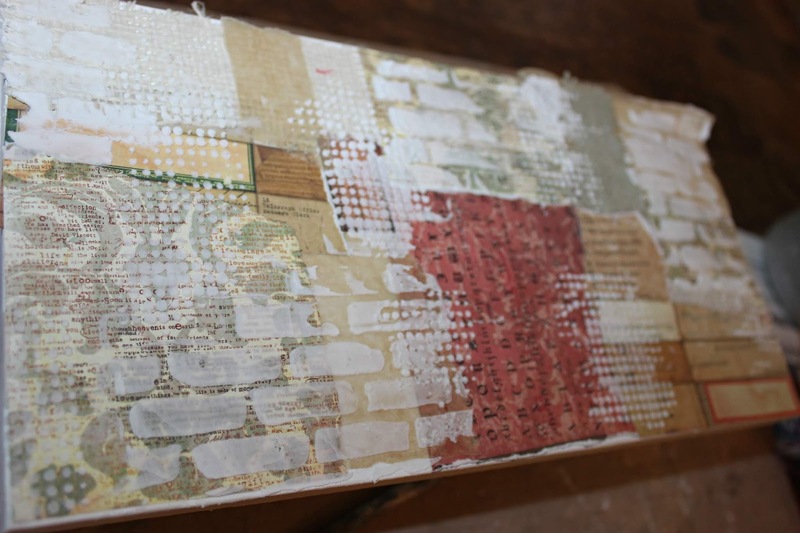 All supplies-over on the Canvas Corp Brands Blog. Wow where has the month of June gone, it's fading fast pretty soon we all will celebrating the 4th of July and our Freedom. 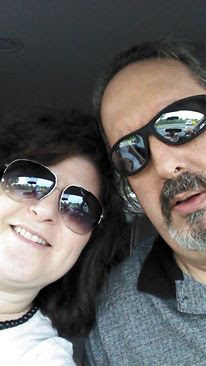 Well before that happens my hubby and I get to celebrate our birthdays! 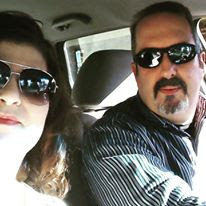 That's right our birthdays are only a day apart, the funny thing is that my whole life I have shared my birthday with my twin brother, then I marry a man and we continued on for the past 26 years of sharing our birthday celebration. And we love it! Oh yes I have said a time or two gosh I have never had my own birthday day! Haha I wouldn't want it any different. 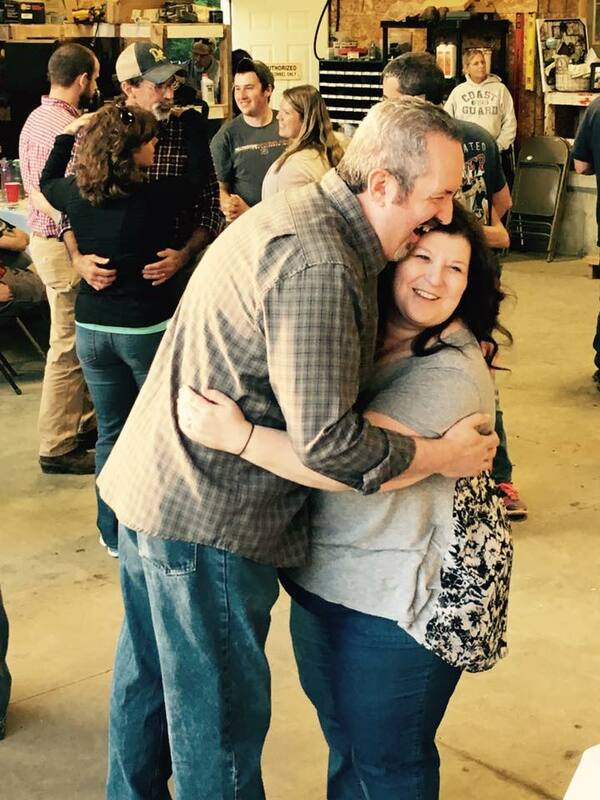 My hubby loves me so and I him, he feels my cup with joy! 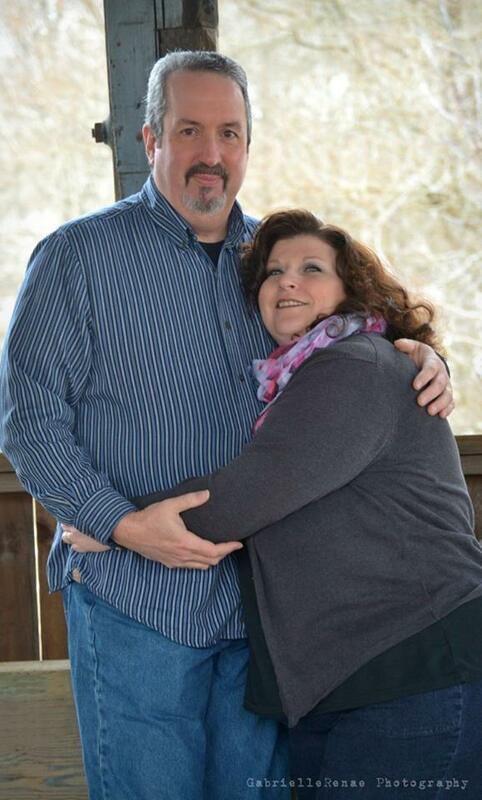 We've been married 26 years and still going strong. and he loves to share it with others. He is a keeper, my man! Oh this pic, just beams the love and joy we have for each other. Envelope I received in my design team package. "welcome" banner using 7g Architextures papers. 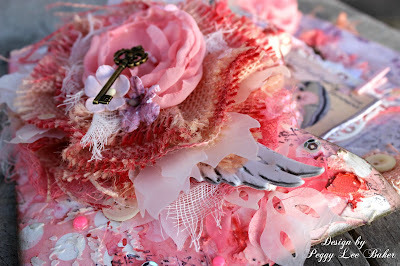 Tattered Angels glimmer mist and paint gives such great texture! personally got in our design team package. 1 inch in on both sides and bottom. Fold your score lines a few times helps to give a good crease . Fold in on the fold lines to create a bag like shape. 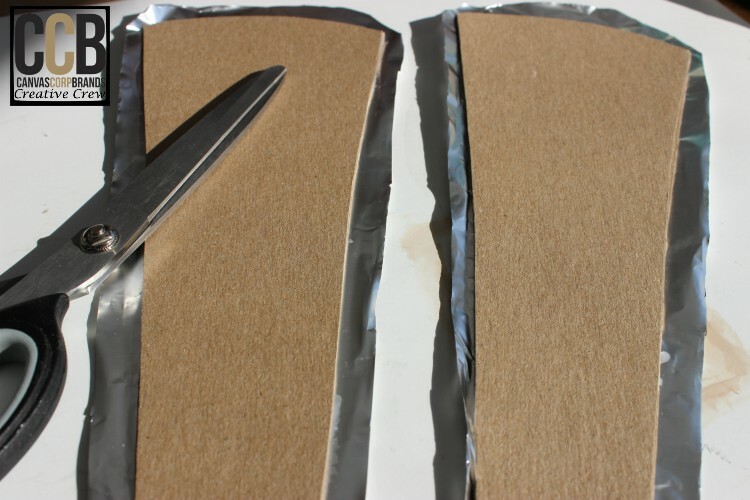 fold the closing flap in half as well as the front flap to the envelope. 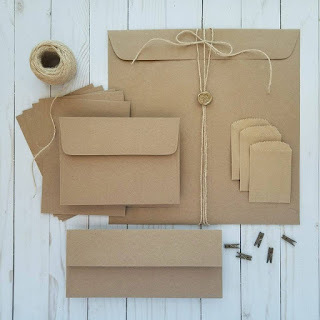 of the envelope to give strength and shape to the envelope. 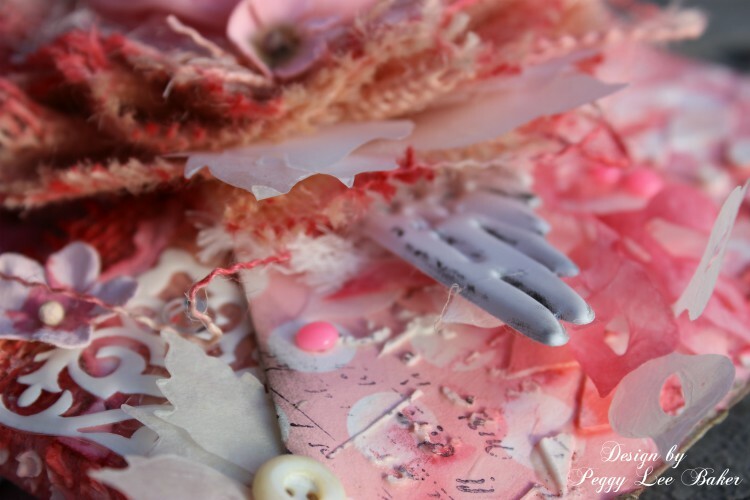 I crinkled up the tissue stock and glued down to the envelope. Created chipboard seams and painted with Gesso- white washed everything, this will help the Tattered Angels glimmer mist, glimmer glaze and high impact paint to stick to. 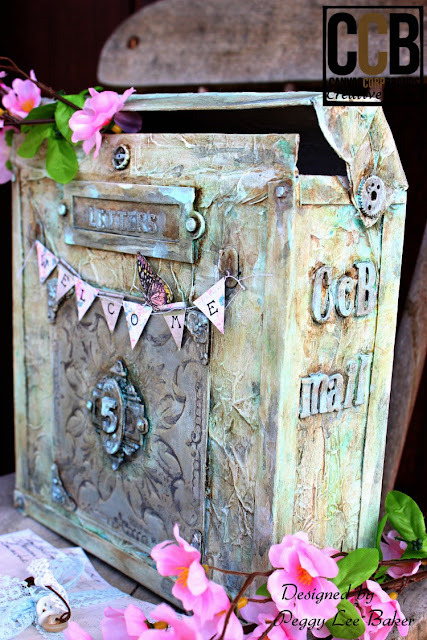 embellishments like the 7G Architextures Tin Tile, hardware and letters. 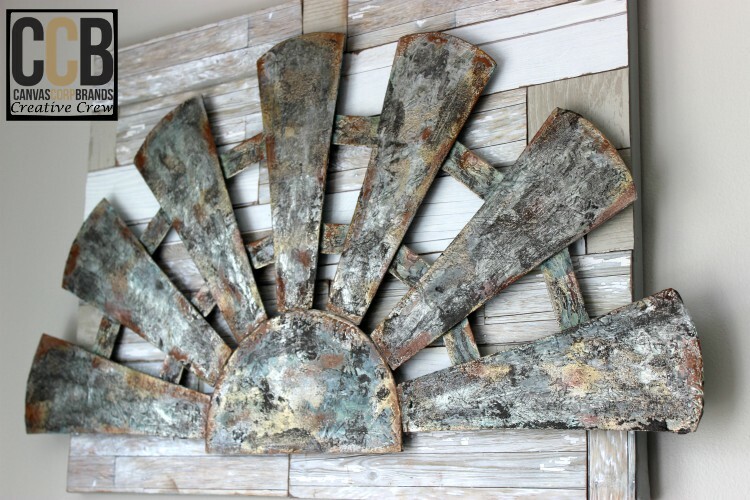 Painted it with a layer of Light Blue of Tattered Angels High Impact paint. 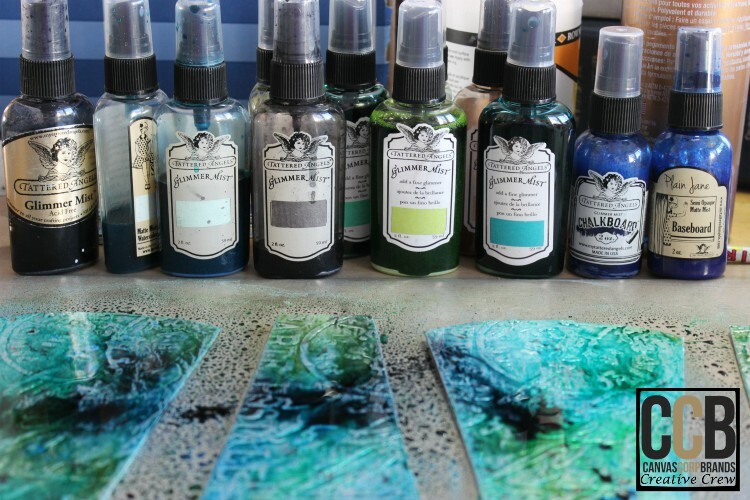 Grab your favorite Tattered Angels glimmer mist and glimmer glazes and color away. Many layers of mist just keep adding til you get the effect you are looking for. 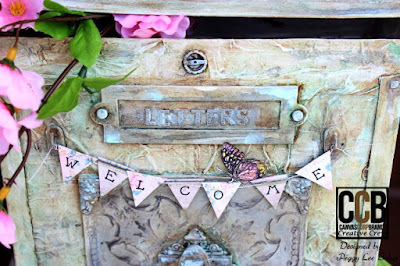 I created a little stack of faux letters and adorn it with spring time florals. to see the rest of the Creative Crew's works of ART. for you to follow along with me. Grab a cup of coffee and enjoy. pages to use online just pick one that you like. 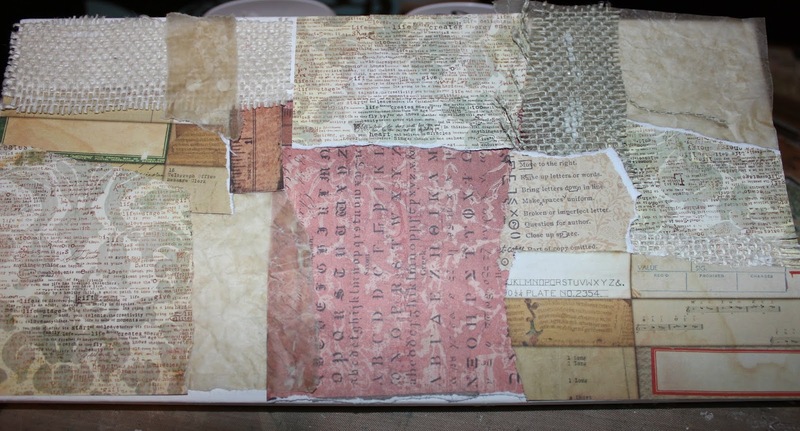 Next I traced the pattern onto chipboard and cut it out (I did 7 panels). Now glue the chipboard panels down onto tinfoil (yes you heard me right TINFOIL). 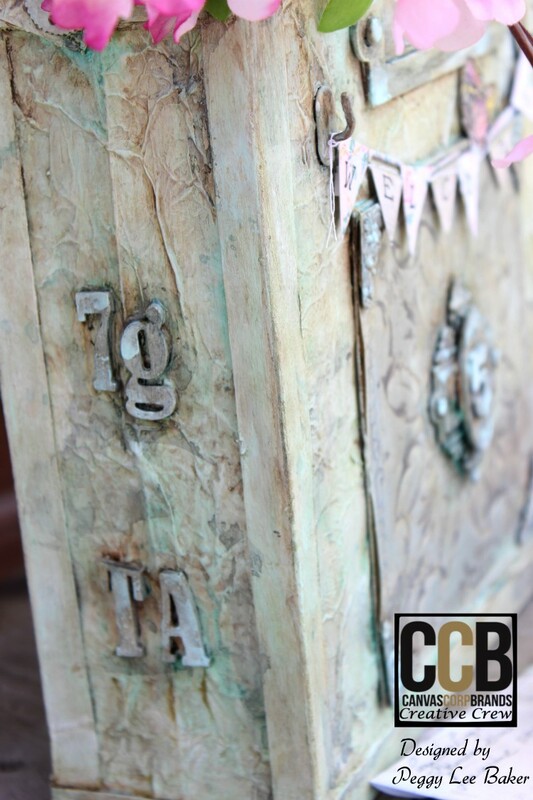 It's amazing what you can create with chipboard and tinfoil together. panel leaving a 1/4 inch boarder all around. Wrap the tinfoil around the chipboard with glue. 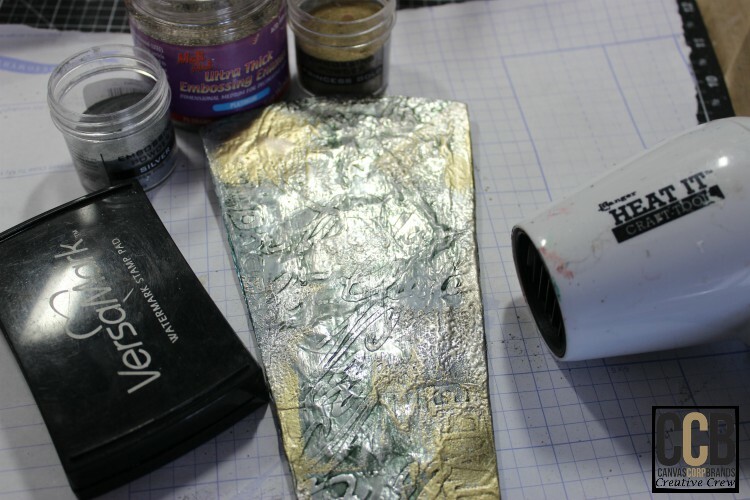 Next I covered the back with piece of tinfoil to fit. 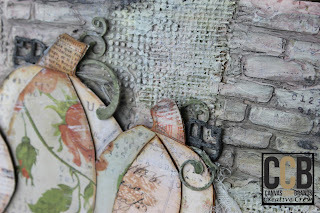 chipboard panel through the embossing machine. 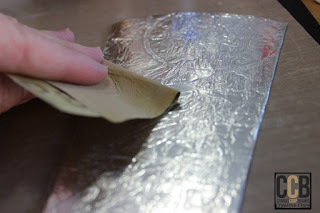 I love how tinfoil looks embossed. 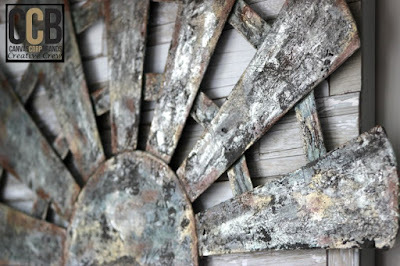 help the Tattered Angels Glimmer Mist to stick to the tinfoil. 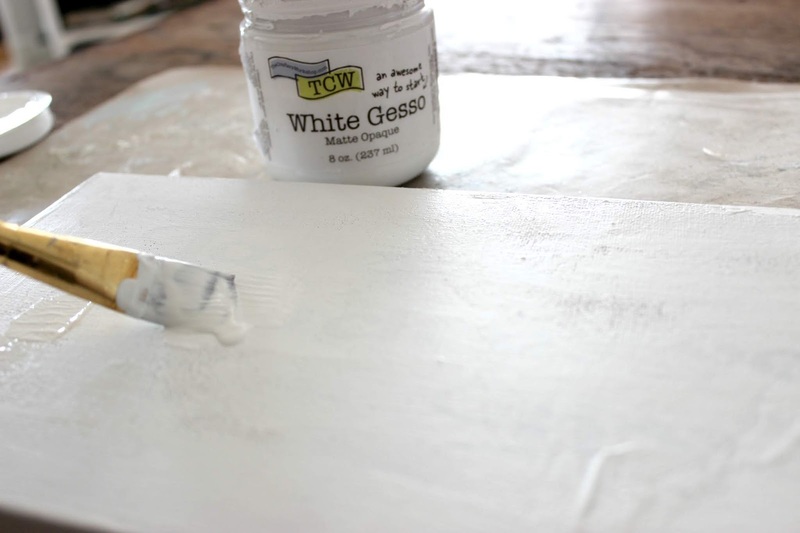 White wash the chipboard panels with Gesso or white paint. (white wash-brush on paint and wipe it off with a baby wipe, etc.). 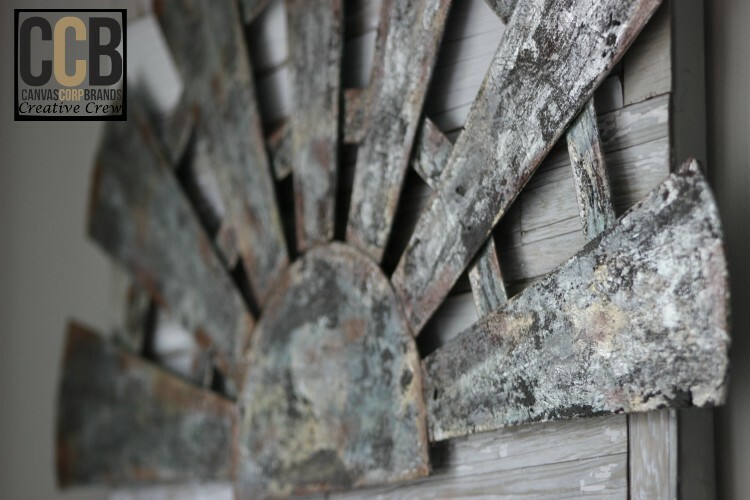 your favorite color of Tattered Angels Glimmer mist. 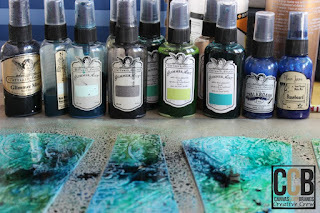 I started by spraying the lightest color down first and worked out to the darkness. 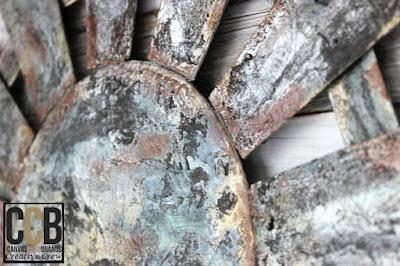 layers of glimmer mist...you don't want mud color to happen. I used a heat tool and paper towel to dry and dab off the excess of color. is dried. I just love the old time feel it gives using tinfoil. 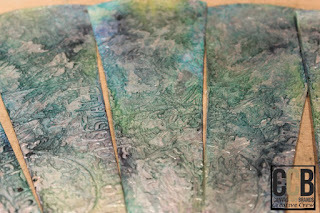 embossing powders and I added a few layers over and over. give tooth for the glimmer mist to hang onto. Oxide Ink-Walnut Stain..glue down, off set the paper slats. To give the faux wood grain look to the background. onto with my fingers, highlighting the textures to help bring them out. 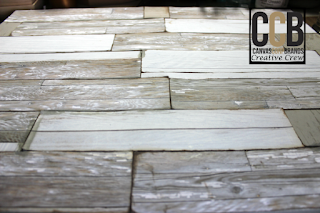 Chalkboard-Cornflower Daze (no longer available).